I have never contacted a speaker after a meeting but I wanted to tell you that your program at the Coachella Valley Quilt Guild last Saturday was one of the best I have ever attended, in the US or even in Eurpoe. If I was still in the meeting planning business, I’d hire you in a heartbeat. Tracey's slides of her February 2016 trip to Thailand include images of local textiles, the decorative arts and architecture, and the intense colors of everyday life in Thailand. Art, fabric, food markets, color and pattern, temples and transportation are all touched upon, with emphasis on unusual aspects of the fascinating culture. Call Tracey at 831-227-8409 to book class, 8 AM - 5 PM Pacific Standard Time. Tracey's slides of the amazing Tokyo International Great Quilt Show. You'll see gorgeous quilts, and learn about Japanese quilting culture, which is very different than ours. 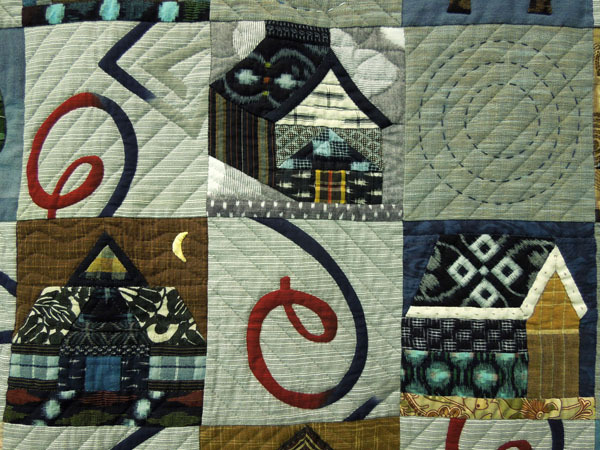 A trunk show of Tracey's quilts designed with Japanese and Asian-inspired fabrics follows. A unique slide show exploring the quilt industry from the business end, including trade shows, advertising, fabric companies and pattern publishing. The lecture includes a trunk show of sample quilts made for different fabric companies, with comments on design, deadlines and challenges of quilt trade shows from a vendor's viewpoint. Tracey's original quilts based on classic blocks are bright, bold and contemporary. This trunk show of more than two decades of quilts, with comments on deadlines and design problems, will amuse and inspire you, and answers the questions: exactly WHAT does a professional quilter DO? Lectures are $550 for a 1 hour lecture, plus travel expenses. $1500 for two full-day classes and a lecture - save $250!